5/1/2012 Aggravate targets only the player. Creatures with hexproof that player controls will be dealt damage by Aggravate if it resolves. 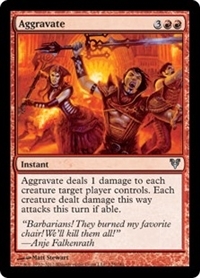 5/1/2012 The controller of a creature dealt damage by Aggravate still decides which player or planeswalker the creature attacks. 5/1/2012 If, during a player’s declare attackers step, a creature is tapped, is affected by a spell or ability that says it can’t attack, or hasn’t been under that player’s control continuously since the turn began (and doesn’t have haste), then it doesn’t attack. If there’s a cost associated with having a creature attack, the player isn’t forced to pay that cost, so it doesn’t have to attack in that case either.